MySpace for BlackBerry released | BlackBerry Blast! 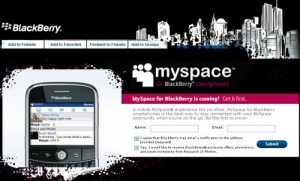 RIM has launched MySpace for BlackBerry, a fully optimized application for MySpace users. It integrates the main MySpace social networking components with the BlackBerry platform to provide instant, push-based messaging to BlackBerry and MySpace users. The software is available at www.blackberry.com/myspace or m.myspace.com using the BlackBerry browser.